Hello, we have another fantastic Festive Delight to share with you today, but first you may remember that we recently shared our favourite budget ways to grow your child's book collection. If you missed our post and would like to take a look, click here. Our top suggestion was to visit your local library and get borrowing! We regularly pop to our nearby library and in the run up to Christmas last year, we were amazed by the incredible selection of seasonal books available. So if you are looking for some festive reads for you or your kids this year, do drop in! Also libraries sometimes host book sales to sell off their "retired" books and you can often pick up some great bargains. 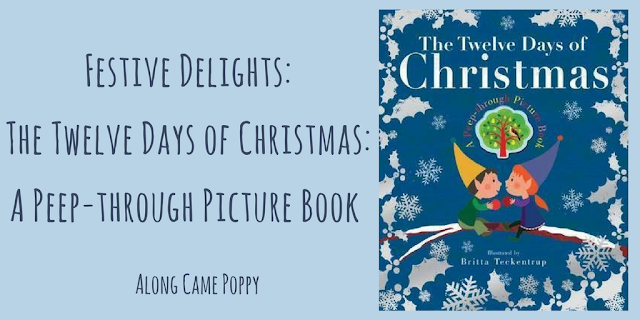 It is actually how we came to own today's Festive Delight, The Twelve Days of Christmas: A Peep-through Picture Book. This lovely book from publisher, Little Tiger Kids, is illustrated by the wonderful Britta Teckentrup. Britta has illustrated some fabulous picture books including two of our favourites "Tree" and "Bee". 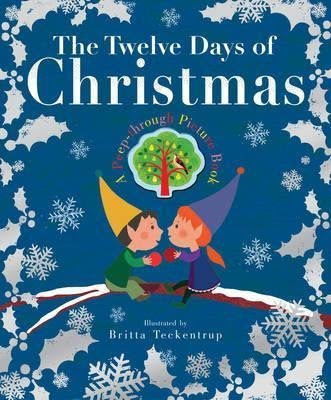 In this book Britta's festive images accompany the lyrics of the traditional song "The Twelve Days of Christmas." The Twelve Days of Christmas is such a great song to sing with young children due to the repetition of the lyrics. It can also help with their counting and number skills. Now if your family is anything like ours, there will always be someone who mixes up their Ladies Dancing with their Lords are Leaping and then everyone usually ends up dissolving in a fit of giggles! Last year we had such fun singing the song during a festive Twelve Days of Christmas walk, when I saw the book at the library sale, I just had to pick it up! The book itself is very engaging for young children as it has cut outs on each page, which gradually reveal the pictures on the final page. This means that there is more and more to look at and count on every page. With the song's conclusion we reach the final page of the book and there are no more cut outs as all the pictures can now be seen but there are some lovely gold decorations which add a bit of Christmas glitz! We hope you are enjoying our Festive Delights, there are still 22 more to come! Please do share your own seasonal recommendations in the comments below or on social media using #FestiveDelights - we always love to hear from you! *Disclaimer: This post contains affiliate links, you can find out more here. We absolutely love Britta Teckentrup's work and this book is beautiful. It's a really lovely introduction to The Twelve Days of Christmas. Britta Teckentrup: yes! Christmas: yes! Another book for the list: yes!